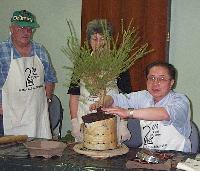 Western Australian Society Secretary John Oldland presented his superb Bonsai forest which was winner of the 20th Annual Perth Royal Show "Best Bonsai Exhibit". 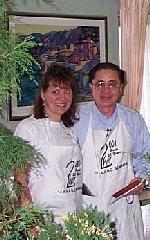 Derek and Sue Oakley presented many of their fabulous private collection specimens also. 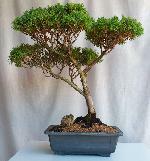 Another before and after shot - a Bonsai masterpiece under construction.. HINT: Click on a thumbnail picture for a larger view. 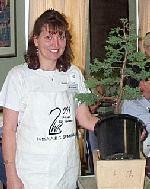 The fourteenth annual AABC Seminar was hosted by the Bonsai Society of Western Australia from Friday 18th to Sunday 20th of May, 2001 at the historic Fremantle Esplanade Hotel. The event also marked the 25th anniversary of our Society and was honoured to feature Mr. Sze Ern (Ernie) Kuo from the U.S.A. as special guest presenter and demonstrator. This highly successful weekend commenced with a congenial Cocktail Party by the pool on Friday evening. 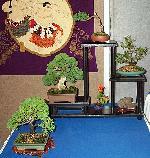 The Following morning, a beautiful Autumn Saturday saw an extensive public display of more than a hundred exceptional Bonsai presented by members of the Bonsai Society of WA decorating the huge West Hall of the Esplanade Hotel. 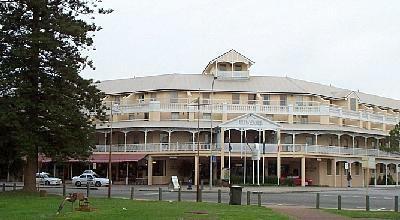 Styles ranged widely, from flowering Bougainvilleas to old, sturdy Port Jackson Figs. 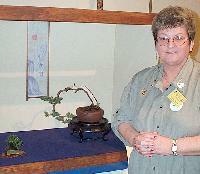 The display was very well supported by visitors and the general public alike, confirming the high standard of Bonsai and their excellent preparation. The Seminar was very popular, with a total of 92 attendees including international visitors from Brazil, New Zealand and "locals" from all corners of Australia enjoying the information packed sessions. 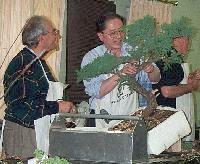 Our special guest, Mr Kuo spoke on the American aspects of Bonsai on Saturday, followed by a full demonstration to attendees during Sunday's proceedings. 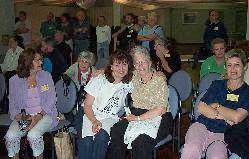 Here are some of the many dedicated Monday Bonsai Workshop observers with Mrs Dorothy Koreshoff from Sydney and guess who (again!). Again, thank you all - we look forward to the next one!